We’re in Glacier Bay in Alaska today cruising the sights and I have tons pictures, there will probably be many posts from this cruise. 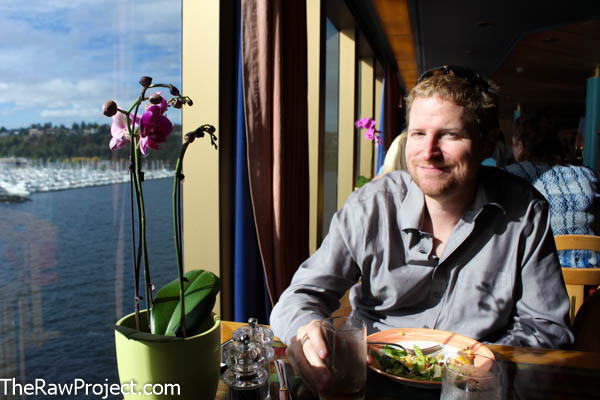 We’re on the Vegan Cruise Planners Vegan Vacation at Sea 2015 and this is the second year for this vegan cruise series, our first time on it. Last year I heard there was about 60 in the vegan group on the ship and this year 120+ which is awesome. Next year the rumor is possibly a Mexican cruise over Halloween, so keep checking the site and start planning! 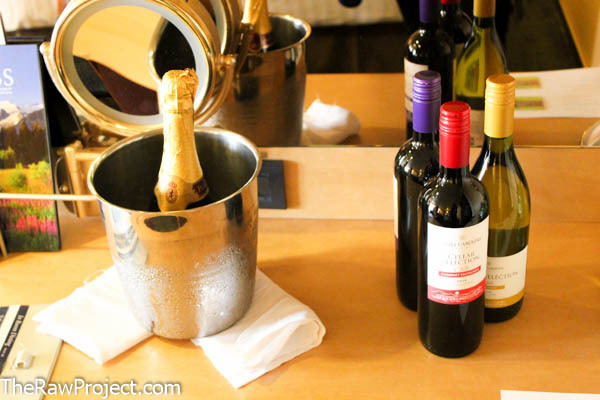 When we first checked into our room on the ship, we were greeted with 3 bottles of wine and a chilled bottle of sparkling wine as part of the vegan package – nice! After the safety drill, hubby and I headed to the lido deck for a light, late salad lunch while waiting for the ship to head out. Seems the salad bar is always open on the lido deck plus a lot of other vegan options at the other food court stations such as pasta, pizza, sushi, etc. 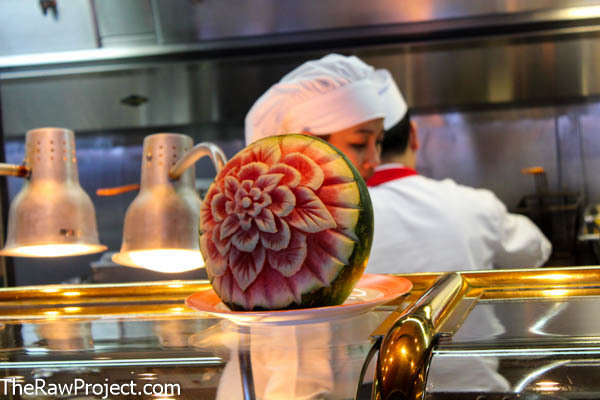 Vegans will not starve on this cruise! 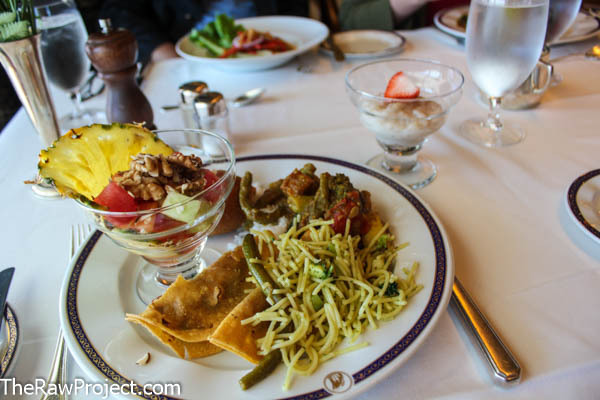 But that is the only time we’ve eaten at the lido deck so far, the vegan group has been getting a section of tables and a vegan buffet in the formal dining room for breakfast, lunch, and dinner and I can only eat so much food! We noticed the ship started moving and headed to the upper deck to take in the views. 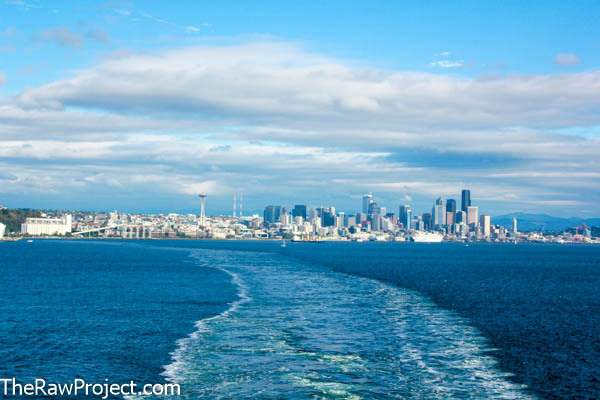 It was a lively deck party with the alcohol flowing as we pulled out with amazing views of Seattle, great way to get the vacation started! And this was the gorgeous view from our room as the sun set that evening. 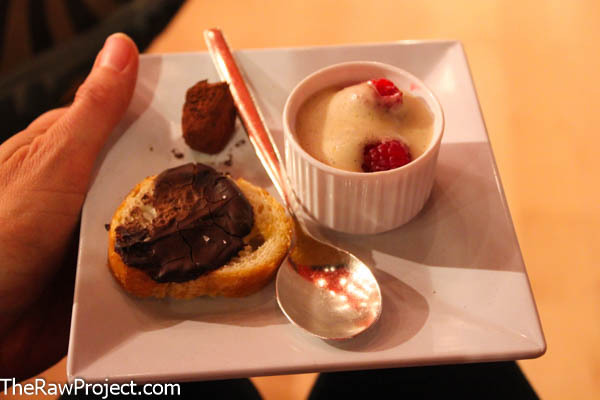 The formal vegan dinners have been really fun with smaller serving dishes so you could try everything off the menu if you wanted. 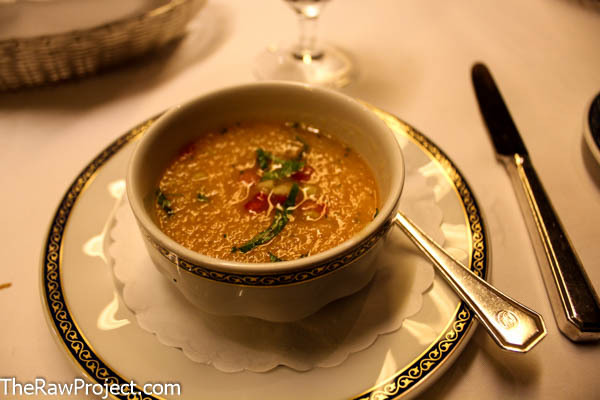 I started with this melon mint gazpacho the first night. It was fun and fresh. 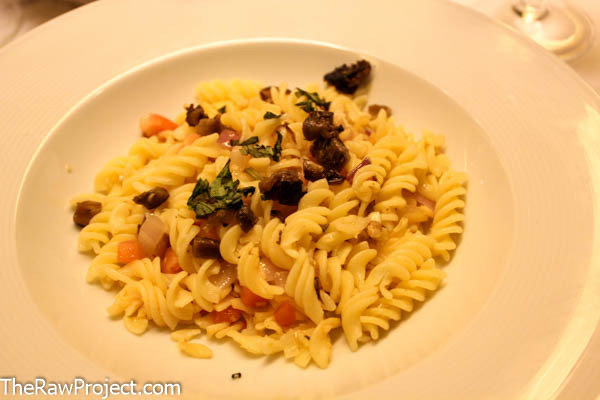 Then moved onto this simple veggie pasta dish. And hubby got the beautiful polenta veggie dish. 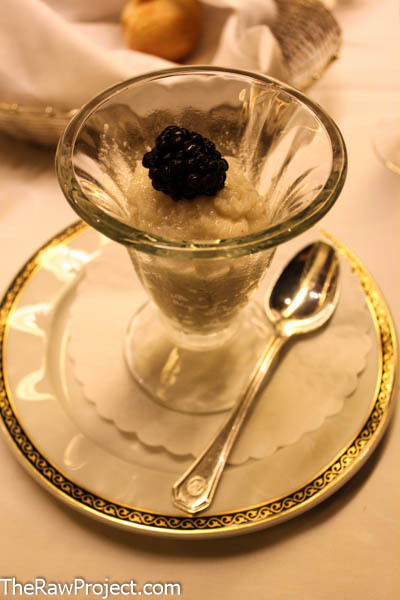 And a simple, small serving of rice pudding for dessert. For a late dinner, it was nice to start out lighter and enjoy sparkling wine with it while chatting with new vegans. 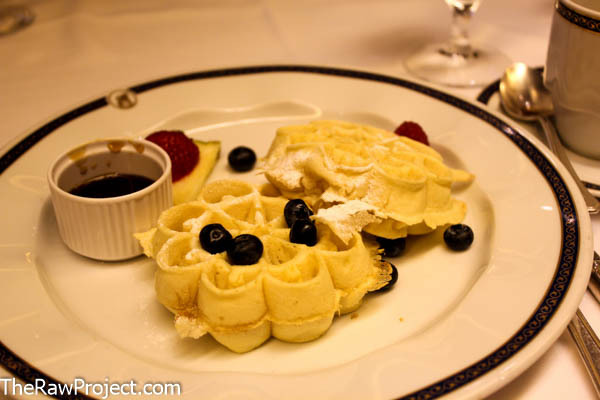 For the first breakfast, it was a sit down and order formal affair where I got the waffles. Truthfully they were just okay if a little bland, but the vegan french toast hubby ordered were an amazing splurge. After exploring the ship some more and checking out the gym, it was time for lunch! 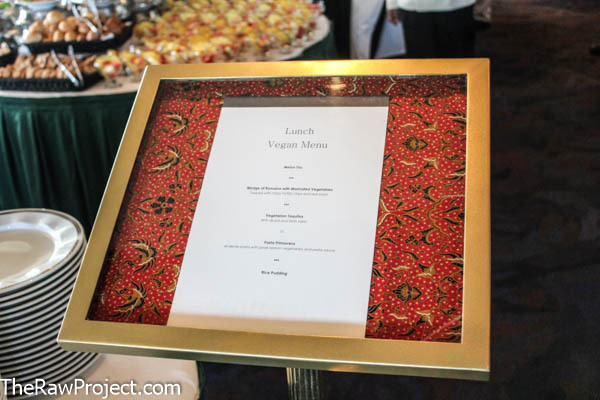 With an impressive menu selection. Lots of fresh veggies, fruit, and hot dishes to choose from and try a little of everything. Which I did, fresh fruit, tasty bean taquitos, pesto pasta, curried veggies, and rice pudding. Hows that for a combo? Yes, it was a splurge and don’t worry, we’ve been getting plenty of fresh veggies and salad too! 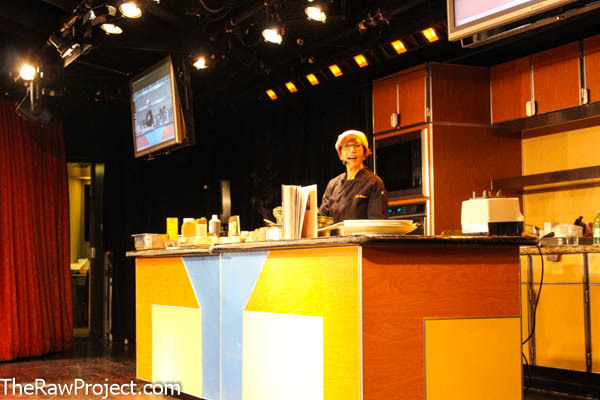 The first day was a day at sea as we headed towards Alaska which made a fun chill day to explore and attend the vegan events scheduled in various locations around the ship – like Fran Costigan’s chocolate demonstration. And that’s about all the pictures I have uploaded so far, did I mention the satellite internet is very slow? And cell signal has been spotty at best at ports. Hey, disconnecting sometimes is not a bad thing! But more coning from our glacier and whale watching adventure and vegan wine and “cheese” party soon! Well color me dark green with envy, that looks like an incredible adventure! 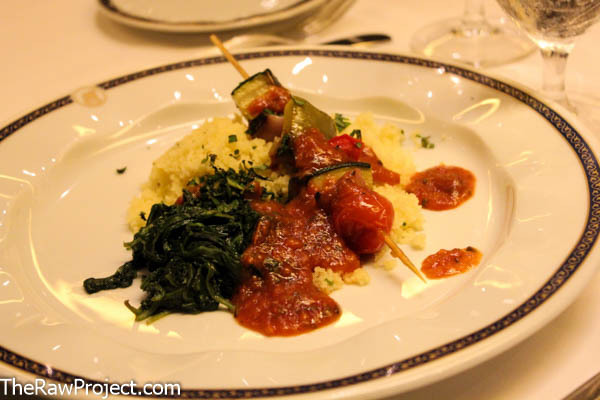 I’ve always poo-poo’ed cruises because I was certain that as a vegan, I would starve out at sea, but it’s thrilling to see options like this come around. 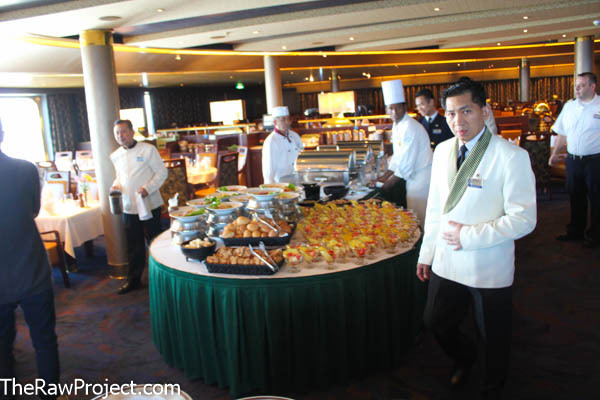 Very true on cruises, it would not be awesome if the salad bar was my only option for the week! But this is great having a full vegan menu and sitting with other vegans! 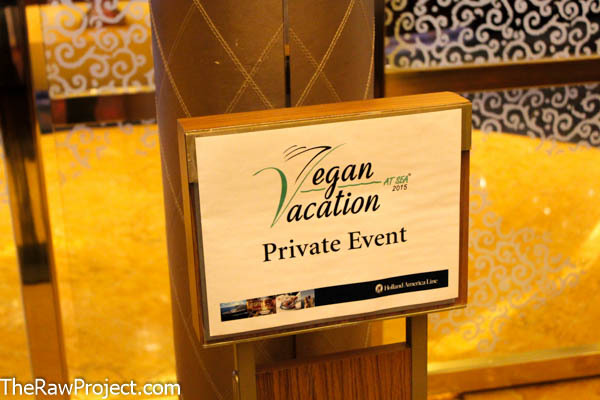 I had no idea that a cruise with Vegan food was even possible. Especially to Alaska! I can’t show my husband this post, he wants to visit Alaska so badly and it’s just not happening now. The flights alone from where we live are 600. Then again, he wants to go camping in the complete wilderness and honestly, I just don’t want to get eaten by bears. But these photo’s allow one to dream. SO lovely. This is a great way to visit Alaska because flying and getting to more remote locations is not easy and many of the towns have no roads to get to them which is crazy to think about! Hehe, I hear ya on camping, mine is talking about a wilderness backpacking trip soon which I’m iffy about. OMG! I’m jealous AGAIN! So lucky you were able to go! I can’t wait to see all the posts, pics, and such! I have to live my life vicariously thru you!!!!! They’re planning another cruise next year – maybe?!?! Wow, this looks like such a cool trip. 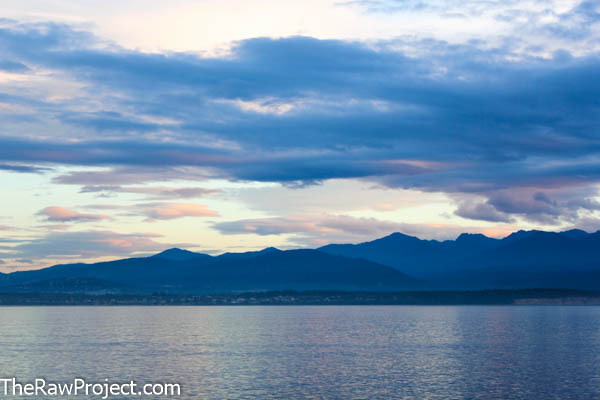 Gorgeous views! Have fun and I can’t wait to live vicariously through your blog. Thanks! We have some more demos and vegan meet and greets on the ship today, can’t wait! Wow, this is a wonderful vacation idea! And bottles of wine when you arrive in your room? Amazing lol! I may have to talk my husband into checking out next years trip! You should, next years should be great over Halloween!